Adjustable chair Plasma PP | Chis s.r.o. Recliner Plasma-PP is intended for wide use in medicine, particularly, however, was designed for the collection of blood plasma. 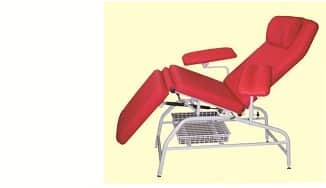 Due to the extremely suitable seat tilt adjustability and positions back and leg part is very comfortable chair, which is appreciated especially during plasmapheresis donor or patient when administered for prolonged infusion. Separately adjustable parts, backrest and support legs, are easily adjustable both staff and seated donor or patient. 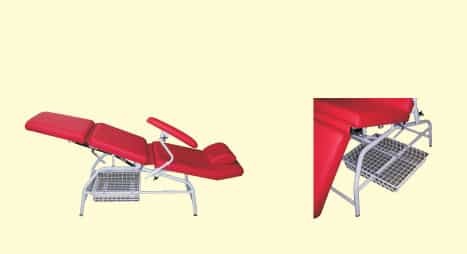 When the collapse of the donor or patient positioning chair can be quickly put into Trendelenburg position. Shaped armrests under the upper legs are adjustable in all directions. The chair is designed so that the positioning distance of no change arm from the armrest. The chair is equipped with an easily accessible basket for storage of personal belongings donor or patient.